Several years ago, I found this quilt kit at a store called Tuesday Morning. You know I couldn’t leave it there! Even though, I was not going to make this quilt. It would only ever look like a poor copy of a Gee’s Bend quilt to me. 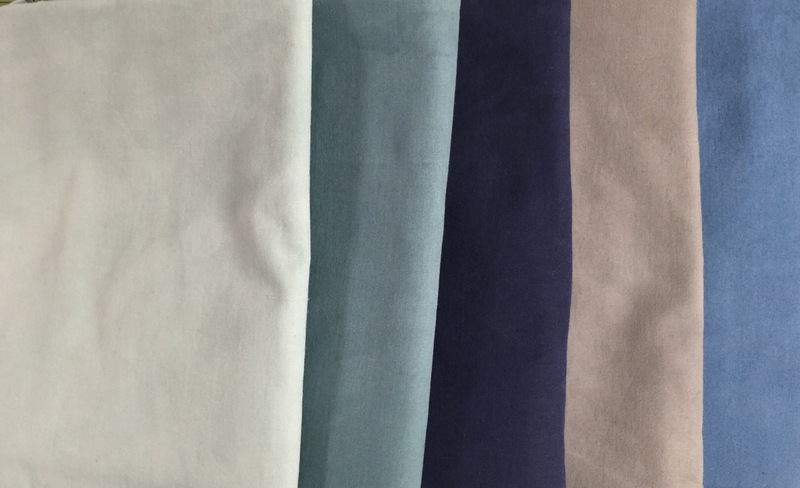 These are the fabrics that came in the kit. They are gorgeous! I am not totally clear on where I am headed with this yet. But I cut some triangles before I left town. And pieced a few geese to get started. I think I am going to have a lot of fun playing with this! wow! I love what you’re doing with those fabrics 🙂 so simple but really effective!! What a find! I’m sure whatever you chose to make will be beautiful! Beautiful flying geese! Those are really pretty colors. It looks like you’re on track to make something beautiful! I have made one of these kits (although not this particular one) and want to give one caution: the fabrics in it are gorgeous (and I’ve already used the leftovers in other projects) but they are also hand-dyed. My kit had red, cream, dark blue, black and brown fabric in it so I did something I don’t normally do — I pre-washed them. I was glad I did because the red did discharge a lot of dye and took a few washings with Color Catchers to finally settle. I believe the black, blue and brown did too but to a lesser extent. So I’d suggest testing the colorfastness of the fabrics using a few of your cut pieces before putting your design together or (if that’s already done by the time you read this) before you wash the finished quilt so you don’t have any unpleasant surprises down the road or can take action to control any potential issues. Those fabrics are lovely! Thanks for linking up. The colors are gorgeous. Looking forward to seeing where you end up. Clever you for buying specifically for the fabric, not the pattern. And, thanks for the reminder I should be checking out my local Tuesday Morning store. I’ve bought cute fat quarter packs there but haven’t been into one for over a year, maybe two. Have fun exploring your design. Oh — you’re up to something again! I can’t wait to see it. I love Gee’s Bend quilts, so curious to see where you are going with this! I echo all of Luann’s questions. Could you please cc me when you respond to her? I love the colours. Can’t wait to see the progress on this one. 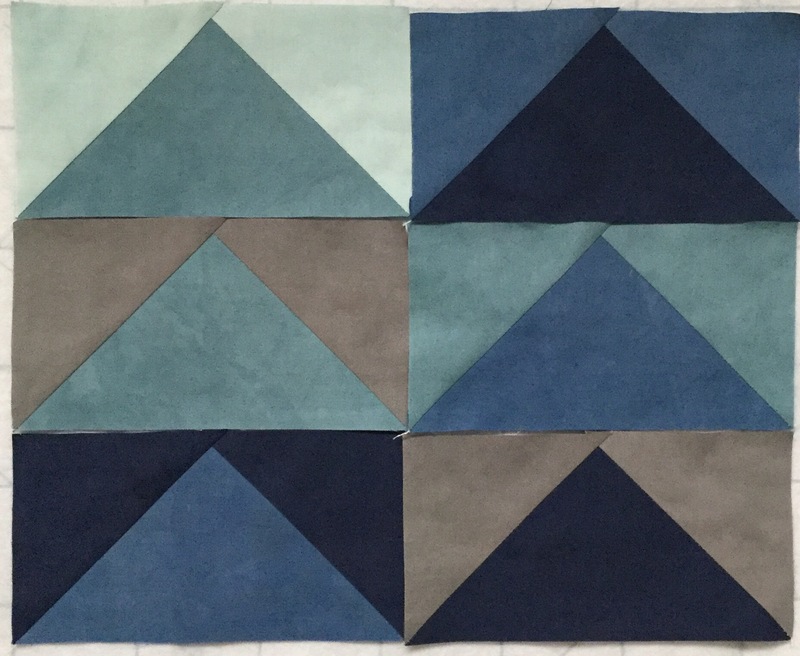 Beautiful color palette, and I’m glad you’re using it for your own design rather than the kit’s copy of a Gee’s Bend quilt. Looking forward to seeing your progress. These kits representing the Gees Bend quilters also appeared at our Tuesday Morning store. Purchased two of them since the price was so good. I love those fabrics! What a fun project. What gorgeous fabrics – it’s going to be a gorgeous quilt! The colors will make something amazing! Geese are always a great choice. Looking forward to seeing how those triangles end up! I have bought several kits just for the fabric 🙂 This fabric looks so yummy! I can’t wait to see what you turn them into! 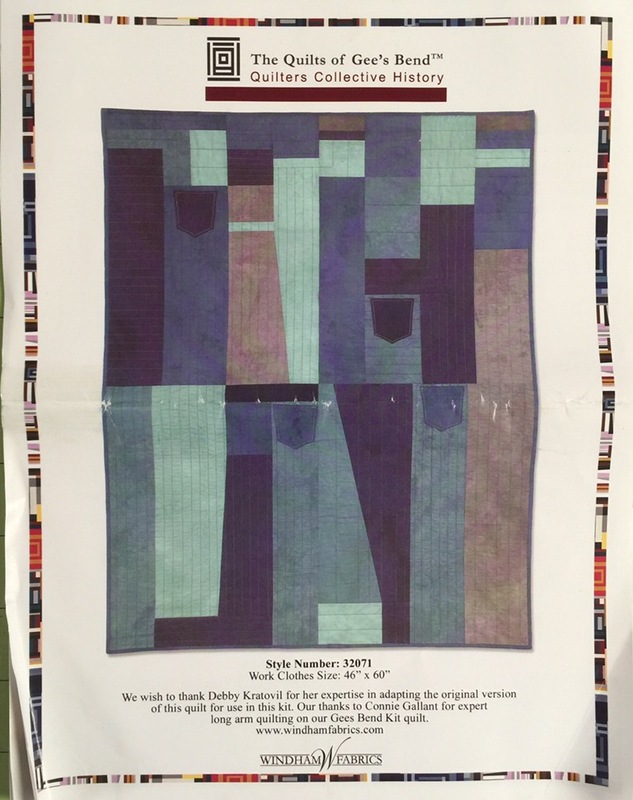 VERY pleased that you are simply using the fabrics and not making what might look like “a poor copy of a Gee’s Bend quilt” — I remember when those kits came out and how odd/disconcerting it was to see such original freeform work in kit/pattern form. Love those fabrics, Katy! Looking forward to seeing what you do with them….I love flying geese, and I am curious if they will stay flying geese, or if they are just units for a totally different block pattern….maybe a star block? Just wondering…. I think those colors are going to make a great quilt. I do have a question though. When you gather fabrics together, or purchase a quilt kit, I notice that you often cut ‘shapes’ before you tell us you have a plan. Do you have an idea in mind? How do you decide on how many ‘shapes’ and which units you are going to use? I thought you were going for HSTs when I first saw your pan of pieces, but then I was pleasantly surprised by the flying geese units. 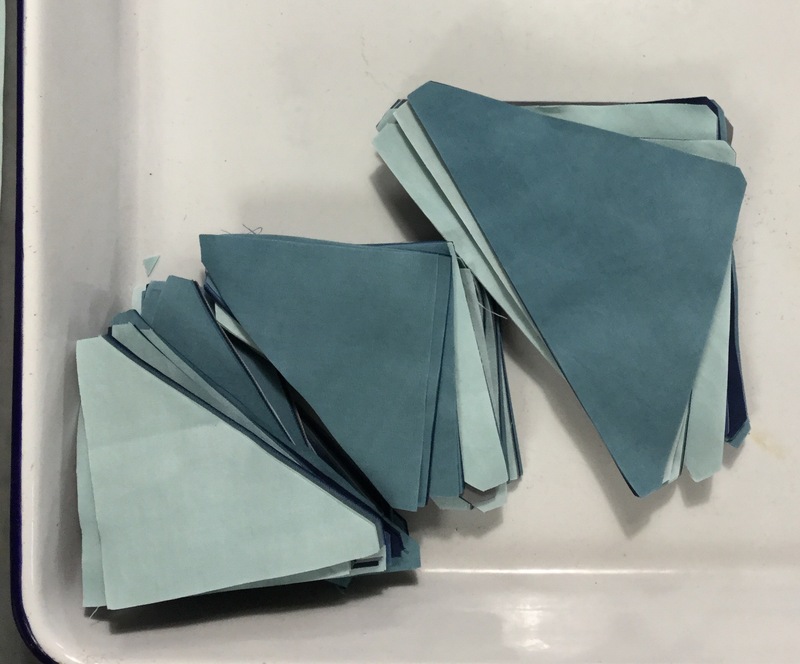 And a bigger question, when you are done with a project do you ‘process’ the remaining fabric into squares, triangles, rectangles, etc? I’ve recently been trying to get ahead of having a scrap basket filled with wrinkled pieces. I want to get them into useable sizes and keep them wrinkle free if possible. Any suggestions?